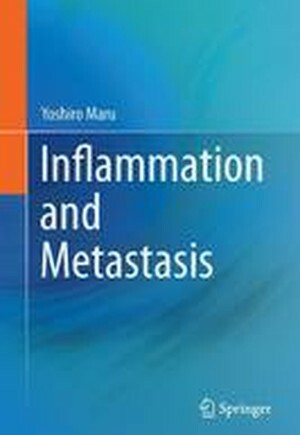 This book provides the latest information on cancer metastasis from the standpoint of inflammation, especially innate immune reactions caused by endogenous mediators but not exogenous pathogens, with ideas on how to understand the complicated mechanisms of metastasis as well as to interpret therapeutic targets. The book includes the topic of the emerging roles of endogenous TLR4 ligands whose functions are shared intriguingly by metastasis and auto-inflammatory diseases such as rheumatoid arthritis. For example, most cancer therapies established so far are effective initially. However, they eventually face the great obstacles of drug resistance, immune evasion, and metastatic progression. One of the endogenous TLR4 ligands is thought to contribute to all three processes. The most important features of the book are to explain a concept of homeostatic inflammation, disturbance of which in the lungs gives rise to the establishment of a pre-metastatic pulmonary microenvironment based on primary tumor-mediated hijacking of the innate immune defense system against respiratory infection. In addition, structure-based thinking is another important feature of this book. It is proposed that inflammation forms a functional triangle with angiogenesis and coagulation, in the center of which cancer is located. Given the proposal of precision medicine by President Obama in the United States in 2015 and the recent success of immune-modulator-based therapy, this book will appeal to researchers in a variety of fields with the title of the book connecting the worst disease (metastasis) and the most fundamental event (inflammation) that is common to many diseases. PART I WHAT IS INFLAMMATION.- 1 General thinking.- 2 Leukocytes.- 3 Triangle.- 4 Sterile inflammation.- PART II WHAT IS ENDOGENOUS LIGAND.- 5 Self and non-self.- 6 Field extension.- 7 Endogenous TLR4 ligands.- 8 Auto-inflammatory disorders.- PART III CANCER.- 9 Cancer in general.- 10 Basic research.- 11 Tumor microenvironment.- 12 Whole-body matter.- PART IV HOMEOSTATIC INFLAMMATION AND METASTASIS.- 13 Pre-metastasis.- 14 What is homeostasis.- 15 Explanation of metastasis.- 16 Therapeutic potential.